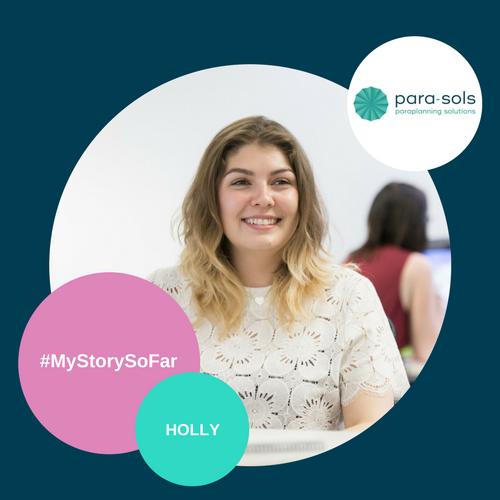 Today’s story comes from Holly, who started as a grad for Para-Sols in May 2017. Since joining us, she has been promoted to Junior Paraplanner, which we think is fantastic! My time management skills have improved significantly! Every case is different – you are always learning new things, helping out colleagues, meeting the 5-day turn around, as well as putting in the hours of revision in (phew!). I know what you’re thinking, it seems quite daunting! If I’m honest, it was at first because it seemed that there weren’t enough hours in the day but fast forward to now and I’m actually managing really well! As each case is different, you need to be creative to tackle problems. Providers will not always send out the correct information, research criteria may not be available on a particular program – it’s about working around these issues and learning from others who are, fortunately, always available to give you a hand. The most significant thing I’ve noticed is how The Grad Scheme has improved my confidence. You’re in an environment where you can ask absolutely anything, (no matter how stupid it may seem) – so being able to feel confident enough to query a tiny detail, which in turn saves the client a tax charge, is amazing. Straight away it was the team; everyone has everyone’s back, you are rewarded for your effort and you feel together as a team. This was never the case at my previous roles where you would feel like just another number. It can get really busy and is sometimes challenging but I would take that over watching the clock tick by any day. What you need is the motivation to learn. Within this role, I don’t think you will ever know 100% of every little thing, especially considering the constant changes to legislation so you have to possess the drive to learn so you keep at the top of your game. There are the obvious, basic qualities – the main role is report writing, so excellent writing skills is a must. You will most likely speak to advisers in regards to their cases so having good communication skills help too. The other point I would mention, is that you really do not need previous knowledge or experience in the sector because I literally had none and the team have completely supported my learning. Well since being here, I’ve been promoted to Junior Paraplanner so I’d say I’ve come pretty far! I’m hoping to complete my remaining 4 exams for my Diploma as soon as possible so I’m working towards embedding my learning and will continue to find the extra hours in the day to fit my revision in. Post Diploma? Well I plan to just keep going and going and thankfully for me, Para-Sols has the routes to progression to feed my ambition. The Grad Scheme provides you with a structured programme that introduces you into the financial industry. Most importantly, the programme is based on your own ability. You have the chance to gain qualifications and be a part of a brilliant, growing team. I have made some amazing friends here and even with the crazy busy work load at times, it’s great being able to work in such a relaxed environment. We have found the perfect balance between working hard and enjoying the environment and surroundings at the same time. Check out Holly’s video below to get a taste of what it’s like to be part of The Grad Scheme. Study club, checking in with mentors, followed by a quiz & some drinks in our very own office pub.